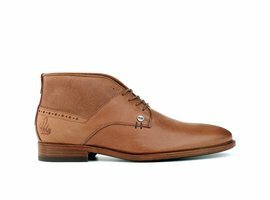 Mid-high cognac colored classic men's shoes with a casual look, the REHAB Alfonso has it. The REHAB ALFONSO is a handmade mid sturdy men's shoe with a casual look.The smooth nose of buffalo leather and the rubber-injected leather sole make this shoe a nice combination between a classic and casual look. The subtle side print and fine stitching on the shoes will give your casual outfit a bit more spice. 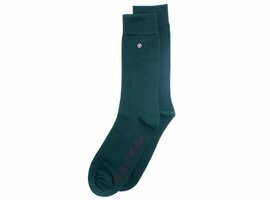 The special midsole with 2mm extra cushioning provides extra comfort. The mid-high shoe is enriched with extra stitching, the RE stud, REHAB stamp and perforations for a rich look. 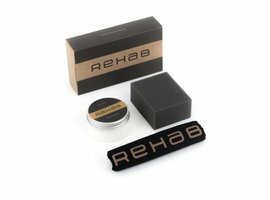 The REHAB Never Out of Style collection consists of a group of selected models that are kept in stock by REHAB and continually supplemented. Does a model fit you well? Then you can easily order this model with the same fit in a different color.